Some shows have an iconic presence that outlasts them. Judy Chicago’s The Dinner Party, Joseph Beuys’ Plight, Bill Viola’s Angels of the New Millenium are three that come to mind. This show will join that select group. That is not to say that I loved it without reservation. But it has something vital and memorable. The Marion Goodman Gallery is a relative newcomer to London but has been around in New York and Paris for some time. It is a gallery with a mission, something of a temple of highly serious issue-based work, but also a commercial enterprise. The Lisson Gallery may be its closest living relative; both able to square the circle of very liberal leaning art in an investment driven market. Goodman’s is also one of the most beautifully refurbished gallery spaces in London. It is an opulently, vastly white void waiting to be filled. Downstairs the work is similar to that which Kentridge showed at the RA Summer exhibition in the small octagonal room – seemingly rather out of place. They are large monochromes mostly in ink on a ground prepared from printed material. This material seems to be from significant left-wing milestones in history – the Paris Commune, Mao’s Cultural Revolution etc. They left me unmoved. There is also some rather undistinguished but not uninteresting sculpture of heads and a film I didn’t really have the patience for. I was unprepared for what lay upstairs. Unprepared except for the music that was audible throughout the gallery space. Upbeat and mournful slow brass marching music with an African twist. When I got upstairs the large upper gallery was dark, there were eight large screens around it, some chairs in the middle. On the screens a sketchy drawn landscape of a bleak, windswept kind. 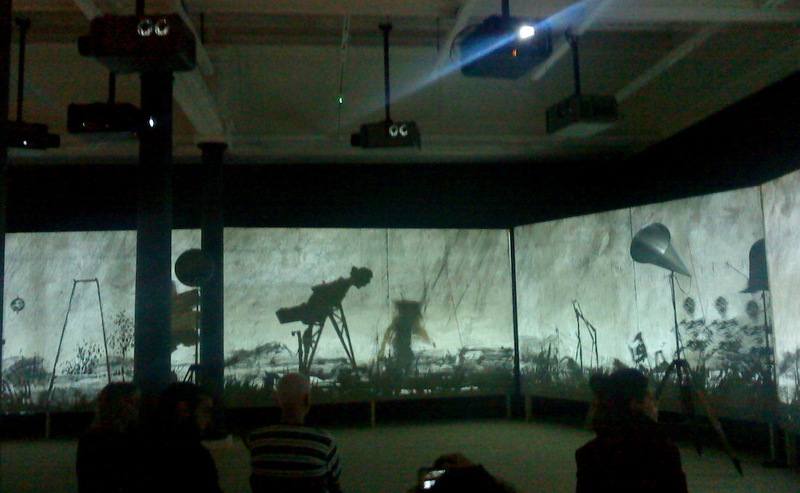 A procession of figures walk at varying speeds along the imaginary path from screen to screen around the gallery. Some look quite normal, others are purely grotesque and imaginary. Some are musicians, some prisoners, some patients. 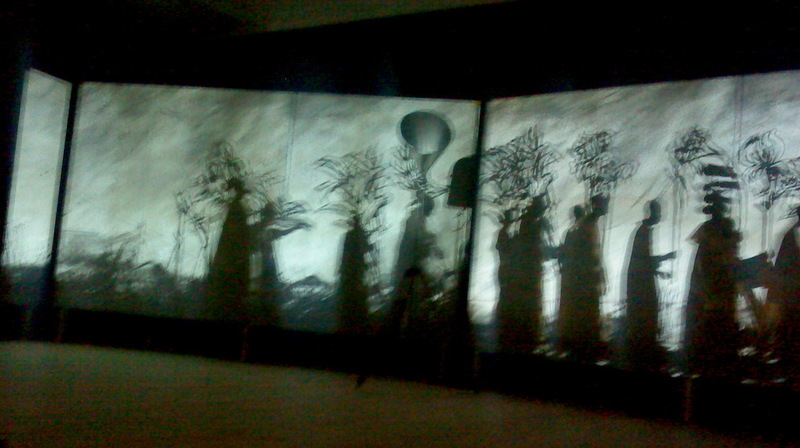 Some are figures carrying large cutout cardboard heads of Kentridge’s making, who resemble some historical or mythical figures. It is a spellbinding mixture of the uplifting and the grotesque, the modern and the old, the African and the European. In fusing together ink drawing, masque, animation and sound design inside a gallery space there is nothing technically new. And yet there is a freshness to the presentation that is arresting, exhilarating even. In spite of this new feel I was immediately and powerfully reminded of Goya’s Black paintings and his threateningly dark pictures of witches and religious processions. What struck me particularly was the way the shadows of people walking in the gallery merge with the silhouetted procession as they step in front of the projectors. No doubt there are many themes here that if you are from an African background will resonate with that, but the work speaks more widely than that also and in an unforgettable voice. 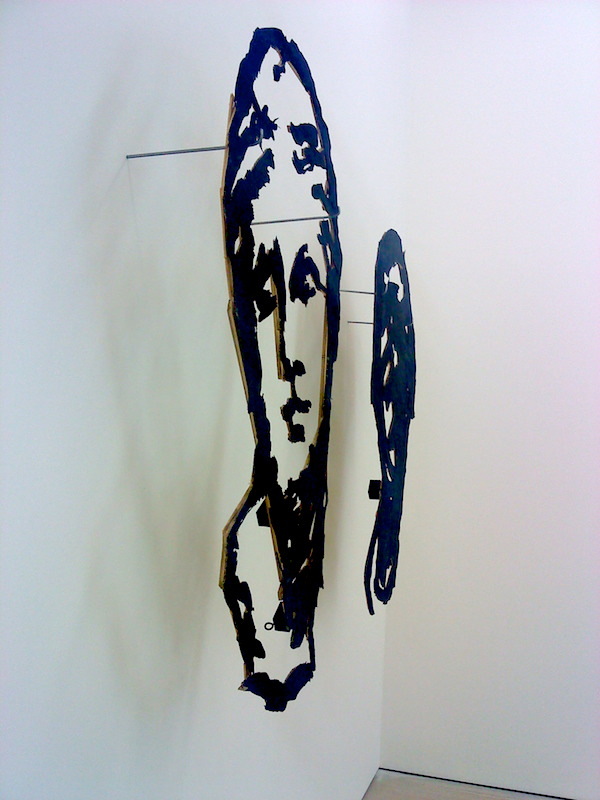 This entry was posted in Art, Conceptual and tagged African, Art, contemporary art, Kentridge, Lisson Gallery, Marion Goodman, Soho. Looks like a very interesting show, especially the upstairs gallery. I feel certain it won’t make it to Seattle! I think we’re a bit of a forgotten corner up here when it comes to good art. I saw Judy Chicago’s The Dinner Party when it was first shown – what an impact – glad you included it in your list. I didn’t see the Beuys or Bill Viola’s Angels, but what about Gilbert & George’s “The Singing Sculpture” ( Underneath the Arches) – another one I did have the luck to see, back in the 70’s in NY. Seems that one lasted, too. Hi Bluebrightly, thanks for reading and for all your comments. Never saw a Gilbert and George performance but sure it would stick in the mind! These very ephemeral shows sometimes in very small galleries can define an artist, or a moment and it’s only luck when you stumble across them. Happy hunting!